This week is dedicated to a topic that is perhaps the most widely untaught part of mathematics: cryptography. It does not appear in school maths, nor has it made an appearance in maths competitions; I suspect the latter is true because problems tend to be either very simple or very tough! However, the ubiquitous use of encryption in communication devices means that the mathematics of cryptography should be more widely taught; outside the pages of puzzle books and well before university. As a student, I first came across it as a teenager attending the Mathematics Masterclasses at the Royal Institution. I later taught a similar course at a Gifted Summer School. Indeed, it makes a great project for gifted maths clubs, summer schools and any other form of extension to the standard curriculum. 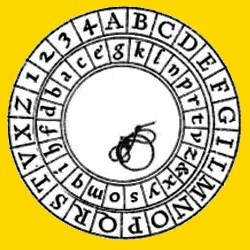 The first puzzle was a simple substitution cipher often called the Caesar Shift Cipher or rot-N, where N denotes the number of letters by which the alphabet has been shifted, or rotated when using an alphabet wheel. The problem with merely shifting the alphabet is that there are very few ways to encode a message; if you get one letter correct, the whole message appears! Assuming a 26-letter alphabet, the simple shift cipher has only 25 settings - the 26th setting is the original plaintext. However, if we substitute the letters randomly, we have 26! possible permutations and that’s over 4x1026 potential ciphertexts – over 40,000,000,000,000,000,000,000,000 in longhand. This Substitution Cracking Tool from Simon Singh, and its frequency analysis, will help you bring such a large number down to size. You may think that the ciphertext is a bit long, but in cryptography, the longer the better. The statistical analysis becomes more useful as the number of letters increases. Keeping the spaces between words also makes cracking the message far easier; assuming you are sure of the language in which the message is written. Try this second message and compare which of the two is the easiest to decipher. When intercepting and deciphering short messages it is sometimes necessary to collect as many such ciphertexts as possible and, assuming they have been encrypted in the same manner, attempt to crack them as one long text. This last example uses the same encryption method as Ciphertext 2. It might help. Now, before you go searching for an online code cracking tool, the links I’ve given to Simon Singh’s website will help you and you might learn something new. Copying the ciphertexts into a decrypter and getting out the answer means that you have learnt how to copy and paste – which I’m sure you know how to do already.